Eliseev S.V., Eliseev A.V., Kashuba V.B. The article presents the research results of mechanical systems with unilateral constraints. The model problem of flipping a particle on a horizontal surface with unilateral constraints under gravitation is considered. The re-search deals with the time and height of the particle reaching the surface in accordance with the surface frequency and vibration amplitude. The estimation of the gap between the material particle and the vibration surface is obtained. The paper presents analytical ratios of frequency and the surface vibration amplitude that provide a predetermined height or the reaching time of the material particle. A number of maximum flipping characteristics are given. The paper discusses restrictions on the mathematical model parameters, based on the surface physical characteristics and the ways to modify the original mathematical model. The methodological framework can be used in the research of continuous flipping mode, taking into consideration some additional constant force. Keywords: unilateral constraints, the interaction of a particle with the vibrating surface, one-touch flipping mode, multiple flipping mode, the gap between particle and surface, flipping height, flipping time, the particle take-off. Loytsyanskiy L.G. The course of theoretical mechanics: in 2 vol. Vol. 2. 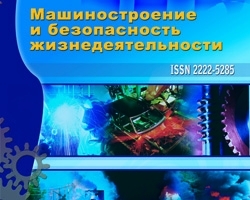 Dynamics / Loytsyanskiy L.G., Lurie A.I. – Moscow: Nauka, 1968. – 638 p.
Lurie A.I. Analytical Mechanics. – Moscow: Nauka, 1986. – 516 p.
Artobolevskiy I.I. Theory of mechanisms and machines. – Moscow: Nauka, 1978. – 640 p.
Blechman I.I., Dzhanalidze G.Y. Vibratory movement. – Moscow: Nauka, 1968. – 316 p.
Selvinskiy V.V. The dynamics of the contact interaction of solids. – Blagoveshchensk: Publishing House of the Amur State University. 2009. – 164 p.
Eliseev S.V., Markov K.K. Some aspects of the dynamics of the oscillatory process with unilateral constraints // Mechanics and Control. – Irkutsk: IPI, 1971. – P. 71-83. Eliseev S.V., Lotkin O.I. The conditions of existence and loss of contact for systems with unilateral constraints // Proceedings of the OMIITa. Vol. 69. – Omsk OMIIT, 1966. – P. 93-99. Gorbikov S.P., Neumark Y.I. The main modes of motion in vibro-tossing // Math. Academy of Sciences of the USSR, Mechanics of Solids, № 4, 1981. – P. 39-50. Eliseev S.V., Eliseev A.V. Modes flip of a particle on a vibrating surface in the model problem with unilateral constraints // Modern technology. System analysis. Modeling. 2012, № 3 (35). – P. 64-75. Serebrenitskiy P.P. General Technical Reference. – St. Petersburg: Polytechnic. 2004. – 445 p.